Skippers are to sign in with Marina Secretary, Diane Bright, and complete all relevant documents on arrival in RCYC Marina (supplied by office). tel +27 21 421 1007). 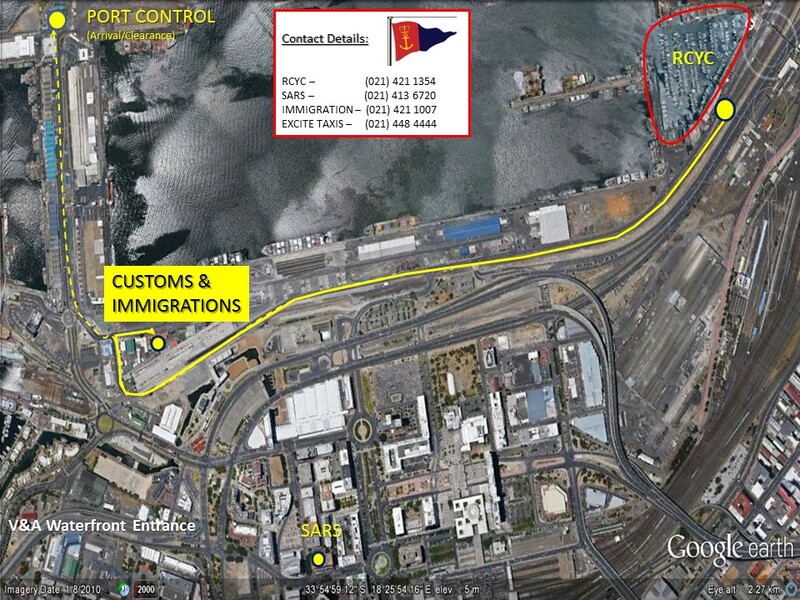 After which, proceed to CUSTOMS (next door to Immigrations in the Transnet Building). CUSTOMS OFFICE HOURS 07h00 – 22h00 daily. Visitors are required to settle all outstanding balances with the RCYC, then complete a VOYAGE PLAN as well as PORTNET CLEARANCE FORM (supplied by RCYC Office). Once completed, three Clearance certificates will be issued for PORTNET, CUSTOMS AND IMMIGRATION by the RCYC office. If you wish to sail in foreign waters a SAS listing and COF are no longer sufficient. You will need to get your vessel registered through SAMSA and also obtain a local general Safety Certificate for your yacht. Without these documents you will not be able to clear customs. ii. Voyage Plan – to include anticipated route as well as Insurance Certificate. Proceed to PORTNET Multipurpose Terminal, situated near the PORTNET TOWER. On weekends PORTNET operates from the BON 1 Building, situated behind the Mission to Seafarers (opposite Table Bay Police Station) in Duncan Road. Following PORTNET, proceed to next door to IMMIGRATION. The last port of call is CUSTOMS CLEARANCE & VAT Refund. To claim VAT, all original invoices are required. For items too large to bring to the office, appointments can be arranged 24hrs in advance wherein a officer will conduct an inspection on board.